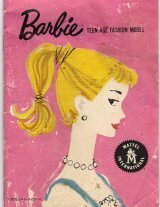 Vintage Barbie Ponytail Dolls were issued from 1959 to 1964. 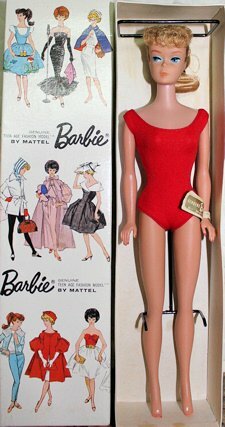 The First Barbie Doll was introduced to the world at the New York Toy Fair on March 9, 1959. Her design evolved over the years and there are 7 different ponytail Barbie variations. These are known by their numbers - #1, #2, #3, etc. Each version has visible differences - use this chart to identify your doll. As a general rule, the lower the number the more valuable the doll. You can click on the link above each doll to get more detailed information and pictures about each version. Face: Eyes had white irises and heavy black eyeliner. Brows were blonde or brown. Red Lips and blush. Blue eyes. Brows were blonde or brown. Red Lips and blush. Blue eyes, Brows were blonde or brown. Red Lips and blush. Blue eyes. Brows were blonde, reddish or brown. Red Lips and blush. Blue eyes. Brows were blonde, reddish or brown. Coral Lips and blush. 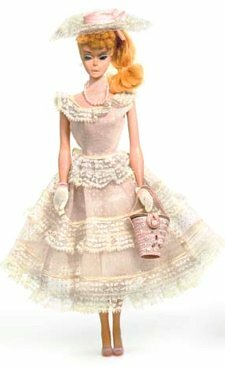 Vintage Barbie Ponytail Doll Notes: #1 Barbie had holes in the bottom of her feet and shoes to accommodate her stand. #2 Barbie did not have the holes and had a different stand. Had either blue or brown eyeliner - it was the only time for both, but the blue is rarer. Some came with a braided ponytail. Body smells like crayon and fades to ivory color. 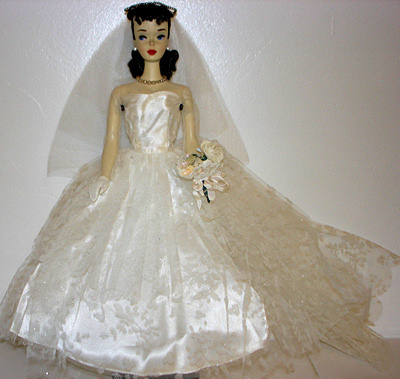 Used a new vinyl that retains its color - does not fade to ivory like the earlier dolls. Some dolls came with a braided ponytail. This is the first Barbie to have a hollow body. Many #5's have a "greasy" looking face due to the type of vinyl used. There was a variation with painted legs. The lip and blush colors varied a lot over the years and many different variations can be found. There were only two different box designs used for Vintage Barbie Ponytail Dolls. This box, dated 1959, was used through 1961. The first boxes were marked Barbie™. During the run of the #3 ponytails they changed it to Barbie®. So #1 & #2 should have ™ boxes and #4 & #5 should have ® boxes. #3 will have either. Along with the clothing, #6 also got a new box. This one has ponytails along with bubble cuts, and it was used for both dolls. Some Barbie Reproductions come with reproduced boxes. These boxes state on the end of the box they are Reproductions. 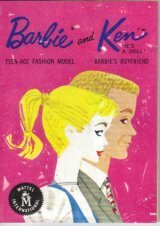 Through 1972 every Barbie doll came with a booklet showing the dolls and outfits that were available. 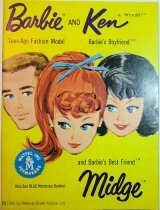 Here are the booklets that came with Vintage Barbie Ponytail Dolls. There were three versions of this booklet. You can see the differences in this blog post. 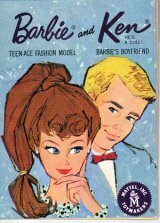 The 1961 edition had the same pink cover as the first three, but also had Ken on the cover. The details of this booklet are in this post. The ponytail Barbie in the booklet was replaced with a Bubble cut, but it was also included in with ponytails. It is also in this blog post. This was also dated 1962. It came out when Midge did, so if your ponytail also has Midge on her tush, this would be the book that came with her. It cam in three different colored covers - yellow, blue and white.